Toronto, April 2014: As more and more broadcasters adopt bonded cellular technology as their primary live ENG delivery method, satellite and fibre service provider TV2GO, has joined the revolution. The Toronto teleport and satellite truck operator has added a Dejero server to its Master Control Room. Now any of the thousands of Dejero bonded-cellular transmitters deployed worldwide can quickly access satellites or the global fibre optic transmission networks. 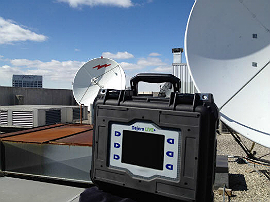 TV2GO also offer two Dejero Live+ 20/20 transmitter systems on a rental basis in Canada. These are normally paired with TV2GO’s servers, but can be assigned directly to a visiting broadcaster’s own Dejero infrastructure.